So who's gearing up to watch the Super Bowl this Sunday? I am admittedly not an American football fan (more into soccer football), so I usually just tell the hubby to call me when on the ads are on. They hype them so much leading up to the big game, that I can't help but watch them. Who remembers the hilarious VW Mr. Jim ad from last year? Loved it! My real focus though is making great food to eat during the game. 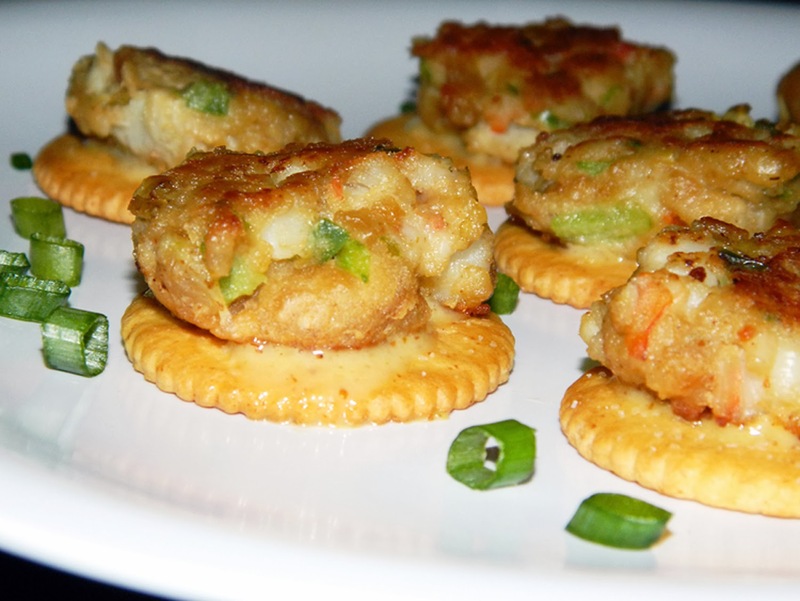 Here's my recipe for Ritzy Shrimp Cakes, using Ritz crackers. These little crackers are pretty addictive (not gonna lie, it's probably the salt! ), and they make a great binder in the shrimp cake. I make an easy Creole remoulade sauce that gives them a nice kick. 1. In a bowl, combine mayonnaise, Creole mustard, honey, and 1/2 tsp lemon juice. Mix well, cover and place in fridge. 2. In a medium pot, combine water and Creole seasoning. Bring to a boil over medium heat. Put shrimp in pot and let boil for about 1 minute (or until pink). Drain and let cool. Chop. 3. Crush 2 sleeves of the Ritz crackers. In a bowl, combine chopped shrimp, crushed Ritz crackers, artichokes, green bell pepper, 1 tsp lemon juice, eggs, cayenne pepper and salt. Mix well. Form into mini cakes, about 1/2 inch thick and 1 1/2 inch wide (size to fit on a Ritz cracker). Makes about 44 cakes. Place in fridge for 15 minutes to get firm. 4. In a large pan, heat oil over medium heat. Place cakes in pan (in two batches), and cook about 3-4 minutes per side. Remove and place on paper towel lined plate. 5. To serve, spread (or use a squeeze bottle) a little of the Creole mustard-mayonnaise sauce on 44 of the remaining Ritz Crackers. Top each with a shrimp cake and garnish serving tray with green onions. Serve.